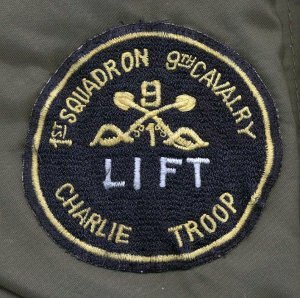 "C" troop, yellow circle unit markng on the OH-6A "Loach". Unique C troop "Combat Administration" patch from Walter Maude. 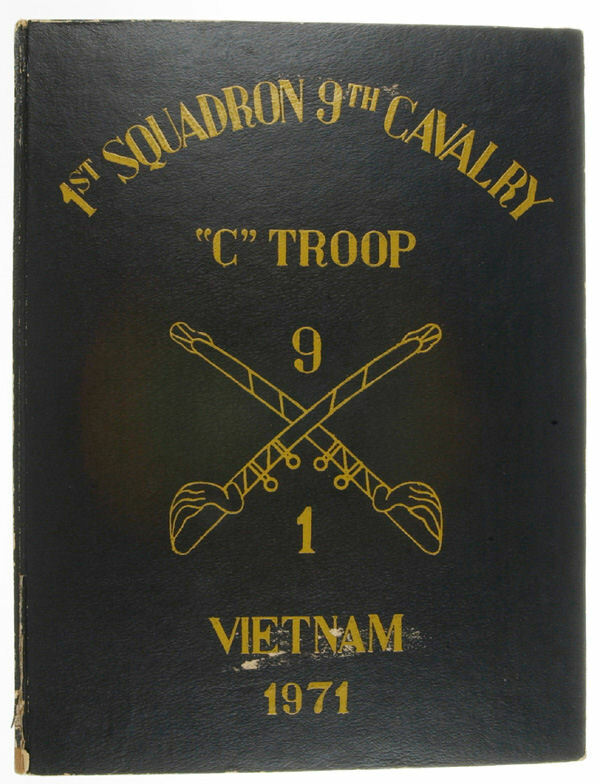 Walter explains� - "My duties as a 71P in Viet Nam was keeping everyone's flight records updated, filing for Air Medals when they had done so many missions and monitoring radio traffic from our Troop.��The pilots filled out flight cards for each flight that indicated a variety of things like rounds fired, confirmed kills, bridges destoryed, etc.� I compiled that info daily and then once a week filed an OPREP 5 which was a weekly total of what was on the flight cards.� My radio name was Mike Echo"
I believe these to be the earliest examples of the SCOUT & LIFT patches for C troop . The SCOUTS patch is WHITE, which is what the platoon was known as and the LIFT patch is BLUE, which they supported (BLUE was the Quick Reaction [QRF] Infantry Platoon). 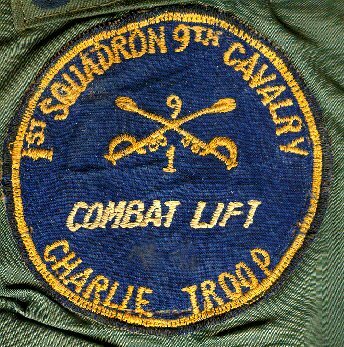 In late spring of 1968 (late April early May) Charlie Troop was living at beautiful Camp Evans and sharing a short pentiprime runway with Bravo Troop and 15th TC. 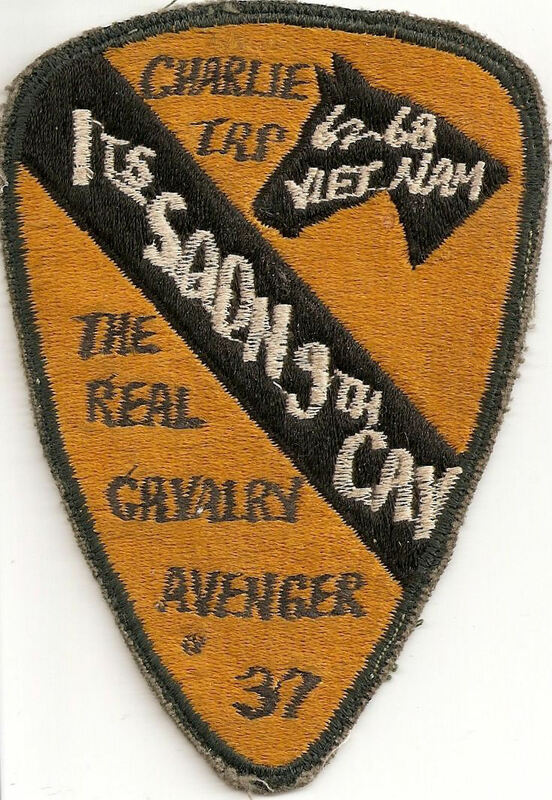 I ran across a friend with the 3/17th Air Cav in the Freedom Hill PX in Danang, who had a pocket patch on his newly issued Nomex flight suit (we were still flying in occasionally laundered jungle fatigues minus the white name tags). 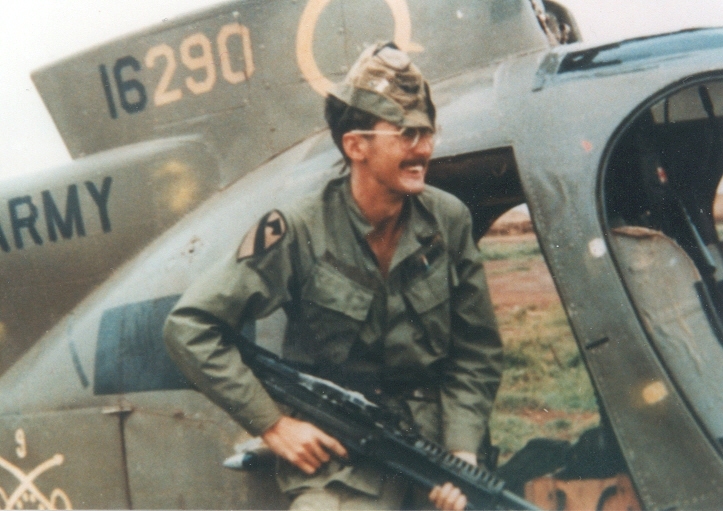 One of the enlisted guys from the Lift platoon was on his way to Taipei for R&R. I started sketching the patch on a piece of stationary but he actually drew the design. 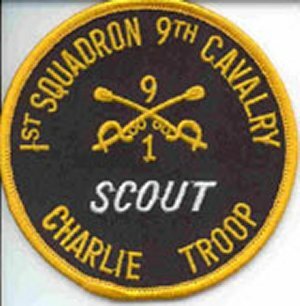 I added the dimensions and the color scheme for what became known as the Scout patch. 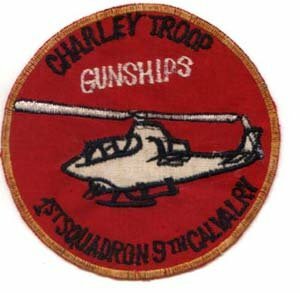 We took up a collection for ten patches each and sent him on his way. 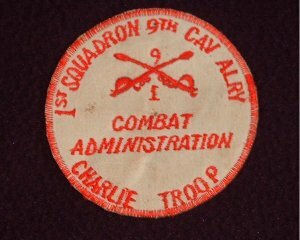 The Red platoon was given equal billing and a chance to order but they were distracted by poker and never joined in the original issue. The original ones had the word SCOUTS in White or LIFT in Blue. 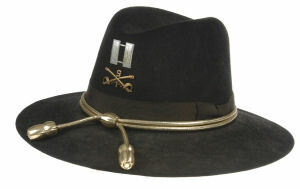 We would have gladly ordered one for GUNS in Red buy as the old saying goes; no money, no honey! That's my best recollection of how it all got started. 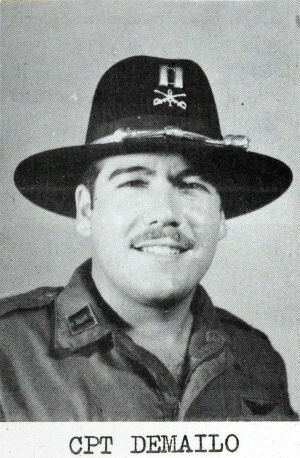 By the way the first 1st Cav Trooper to burn alive in a Nomex was a 1st Brigade Scout by the name of WO1 John Hewett who dumped his OH-13S into a bunker on the Street Without Joy (Highway 1) near Quang Tri. 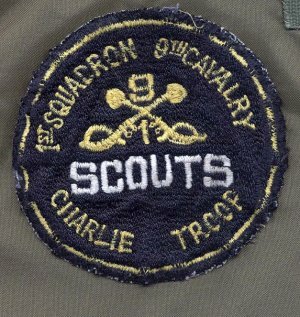 In typical Army fashion, they waited to open his flight suit until they could get the video set up to catalog his injuries. It burned off his mustache, eyebrows, nasal hair, and a bit of his ear lobe, and left a fine zipper imprint on his chest but he was otherwise fine. God bless Nomex! 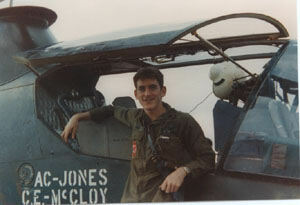 Clyde "Birdman" Hughes with -290 before she was shot down. This is summer, 1970 probably at LZ Buttons. 290 after I was shot down in her. Yellow silk Cav scarf worn by Gun Platoon Commander Al Demailo. Note name is mis-spelled. "Classic Cav Stetson - still covered with "Vietnam dirt" as last worn by Al Demailo while flying with C troop. Period photo taken from the C troop History book shows "Big Al" wearing his Stetson In Country. 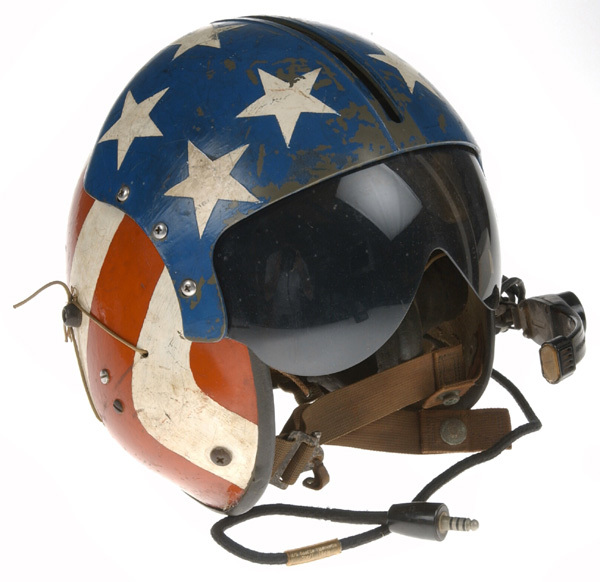 Unique "Captain America" theme paint job on Al Demailo's APH-5 flight helmet. 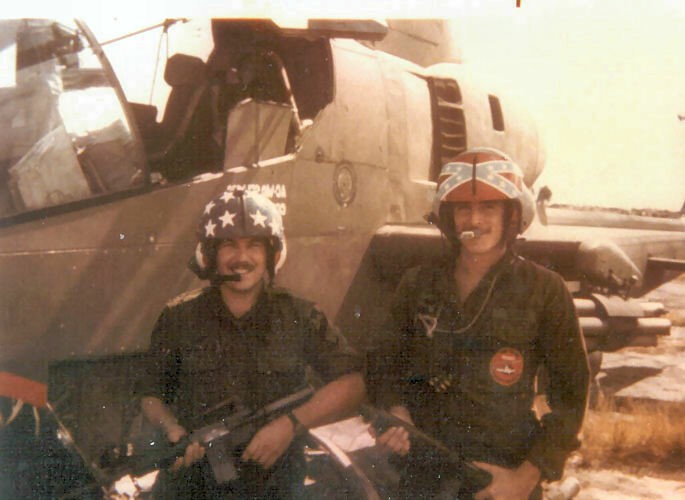 Period photo taken from the C troop, 1/9 Cav unit history shows "Big Al wearing the helmet in country. Very few were fortunate enough to get home with their personalized "skid lids". Al (Demailo) and I in our helmets. Taken early in 1971 at Tay Ninh, while C Troop was tasked to the 2nd Cambodia Excursion. 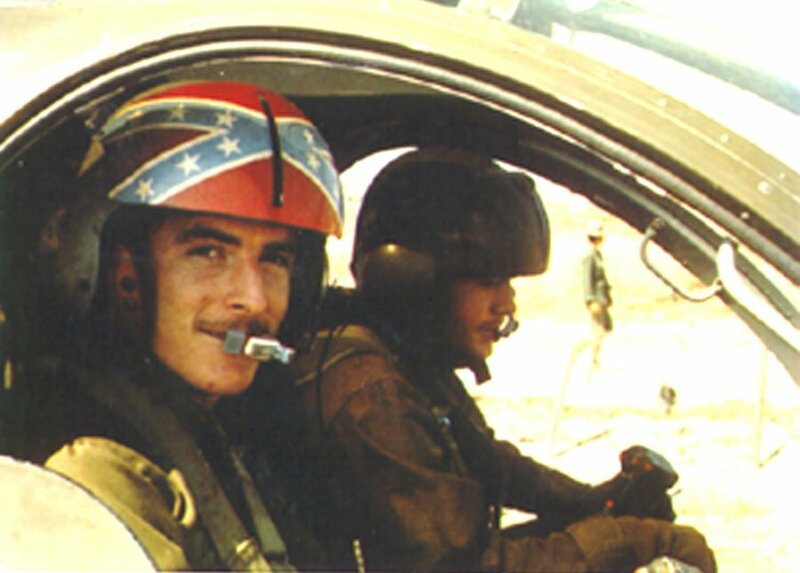 We both were Cobra pilots. He from PA and me from Mississippi as the flags on the helmets reflect! 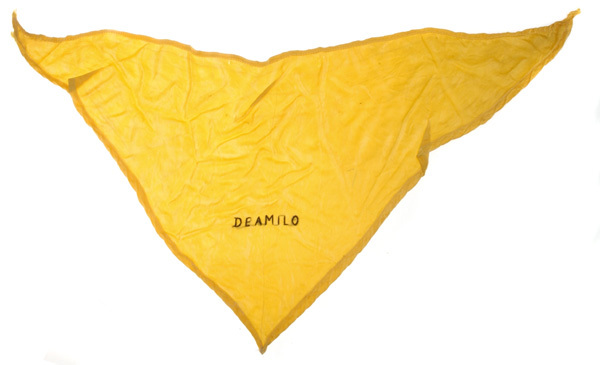 Circa spring, 1970. 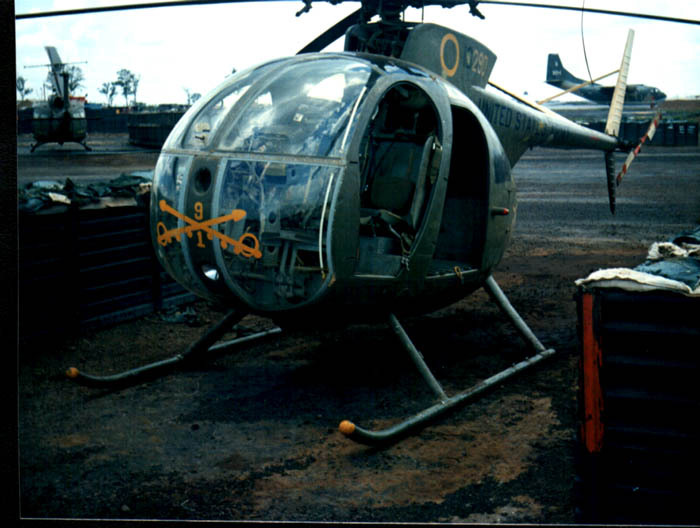 The person who sent it to me (forgotten) said someone else took it from the door of a Huey. The nearby bird is marked "Iron Butteryfly". 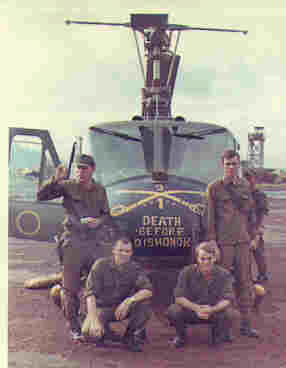 That young, skinny guy is me, standing by my Cobra, "The Crystal Ship". That white helmet is not mine -- I don't know who's it was; I have a vague memory of someone having a white helmet. 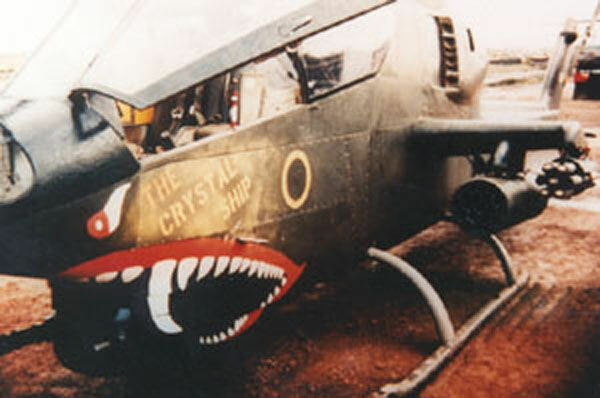 My CE was Glen McCloy, who originally named and painted "The Crystal Ship". Glen and I had planned to smuggle home the painted panels from each side as souvenirs. Unfortunately, LT Van Joyce and CPT Joel Hageman were shot down and killed in -062 in Cambodia on 3/12/71 while I was on R&R. 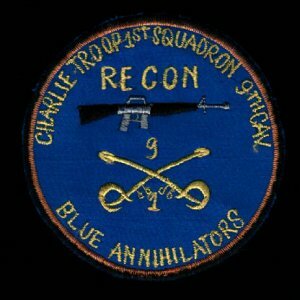 Corgi has recently released a Charlie Troop AH-1G in a metal 1/48th miniature! It happens to be a specific bird, "The Crystal Ship" (68-15062), the very one I flew in 1970-71! 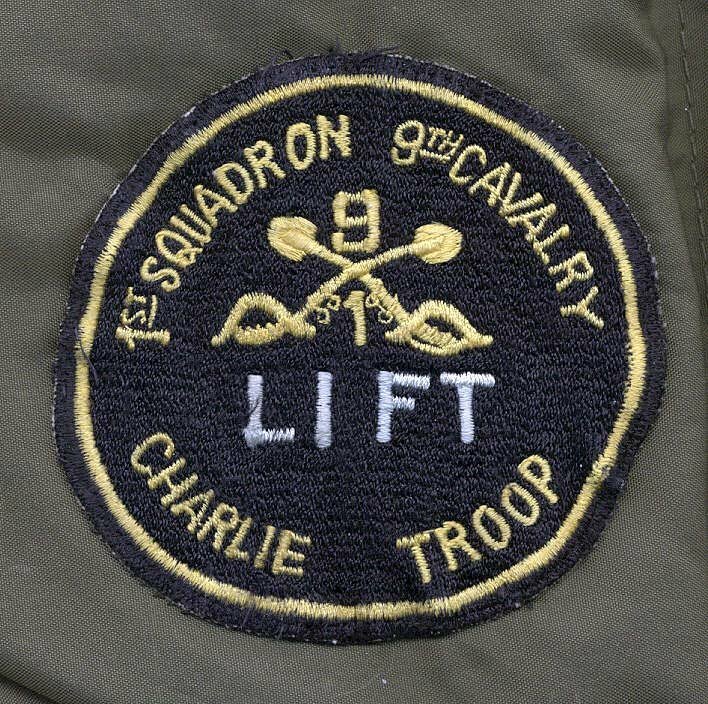 It has C Troop's shark's teeth and a Cav Patch on the vertical stabilizer. 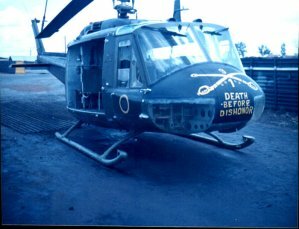 We need to consider this a special tribute to LT Joyce and CPT Hageman, as well as all the heros we in the 1/9ths lost! WO Barry Sipple on the right, circa 1970, Phouc Vinh (III Corps). I'll have to ask him who his gunner is. 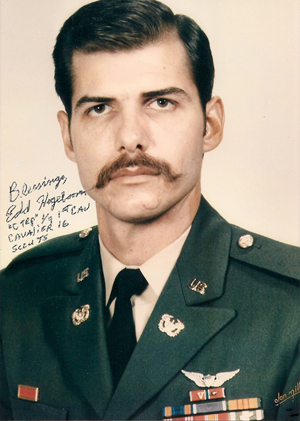 During my quest to locate former buds, I met CPT Ross Rainwater (around 1998) during a work trip to Nashville. 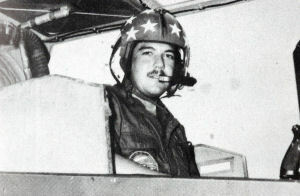 Although Ross was in Operations, he was Cobra qualified and flew front seat some. I wondered if we had flown together. After sitting through lunch and then dinner, he finally had to go. He then pulled out a large envelope and handed it to me as he was leaving. 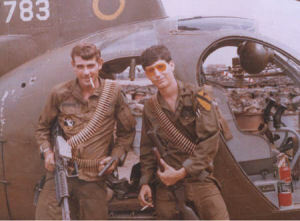 It was an 8x10 of a slide he had, proving that we had flown together. He had taken the shot from a POL somewhere. 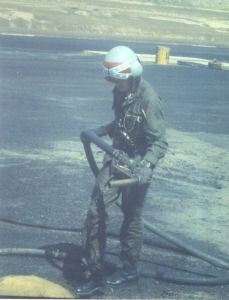 My skinny self, standing, pensively watching the JP4 drizzle in the wind after fueling the bird, helmet clearly shown. Now my favorite photo of me from Vietnam. Can't believe my boots look shiny. But I remember that the hootch maids polished them on days we had off. This is a "personalized" Cav. 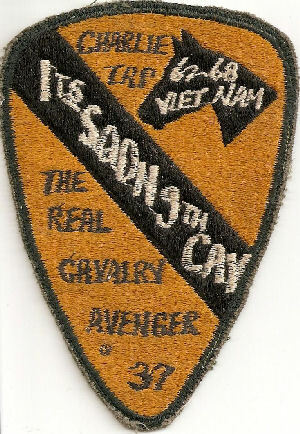 patch I had done in An Khe in late March 68 when I was waiting to board the big bird home. I did the text layout and watched the guy sew them -- he whipped them out in about 10 minutes -- I still remember how impressed I was with his skill.. 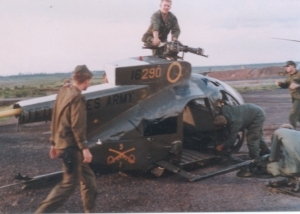 This is a typical depiction of what went on from the Front Seat of a 1/9th Cobra. All of this grease pencil stuff is wiped off at the end of the day. And all of it has its purpose and tells a story. On the top right is the daily code, translated, so we didn't have to consult the code wheel. The circled (boxed) numbers are something I personally demanded of my co-pilot: the current grid coordinates of the Little Bird (scout ship) we were covering. When they get shot down, there is no time to fumble with a map while both pilots are shooting in repeated dives. 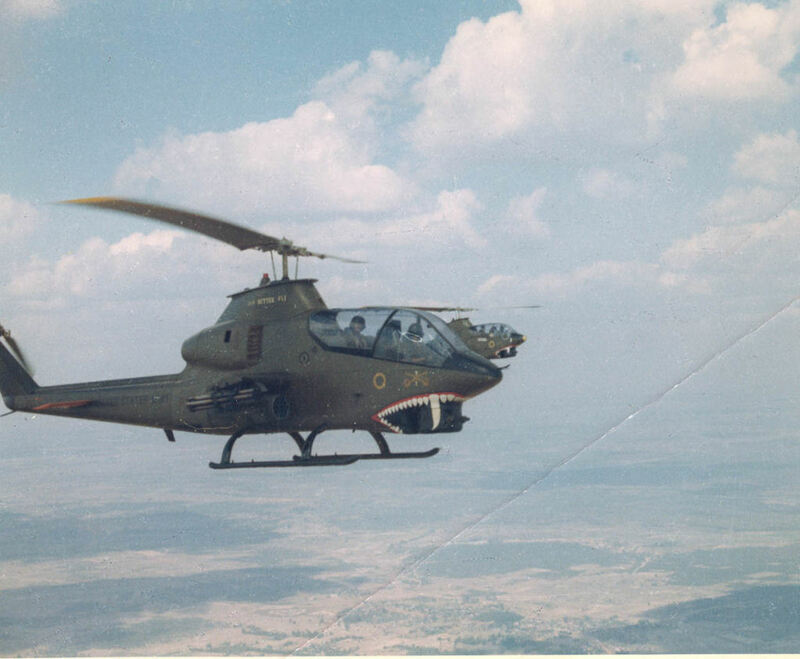 Fortunately, I was very lucky -- I never lost anyone in a Loach while I was High Bird. Others were not so lucky. 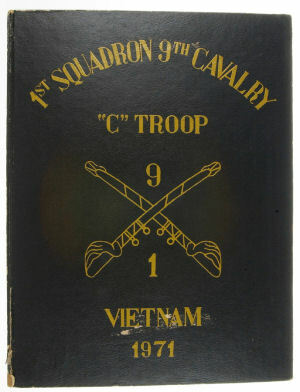 We are talking about this even today on C Troop's listserver. Ron "Barney" Vestal is in the Front Seat. Coincidentally, he took over Crystal Ship as A/C after I quit flying just before I went home. He also was a Scout Pilot before getting a Vung Tau transition to Cobras -- not the usual trajectory to Cobras. 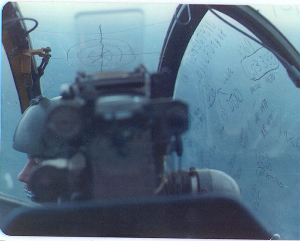 But being a former Scout Pilot, we had a very different feeling when covering from above. 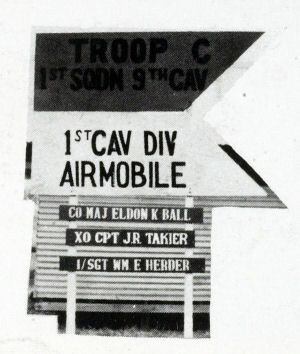 Image courtesy of Walker Jones, C troop, 1/9 Cav. Image courtesy of Edd Hogeboom.